The sun has come up and I am sitting by a window that is foggy with the breath of a life gone by. I'm a sight this morning: two shirts, heavy pants, a scarf wrapped twice around my neck and tucked into a thick sweater knitted by my daughter thirty birthdays ago. The thermostat in my room is set as high as it will go, and a smaller space heater sits directly behind me. It clicks and groans and spews hot air like a fairy-tale dragon, and still my body shivers with a cold that will never go away, a cold that has been eighty years in the making. Eighty years, I think sometimes, and despite my own acceptance of my age, it still amazes me that I haven't been warm since George Bush was president. I wonder if this is how it is for everyone my age. My life? It isn't easy to explain. It has not been the rip-roaring spectacular I fancied it would be, but neither have I burrowed around with the gophers. I suppose it has most resembled a blue-chip stock: fairly stable, more ups than downs, and gradually trending upward over time. A good buy, a lucky buy, and I've learned that not everyone can say this about his life. But do not be misled. I am nothing special; of this I am sure. I am a common man with common thoughts, and I've led a common life. There are no monuments dedicated to me and my name will soon be forgotten, but I've loved another with all my heart and soul, and to me, this has always been enough. The romantics would call this a love story, the cynics would call it a tragedy. In my mind it's a little bit of both, and no matter how you choose to view it in the end, it does not change the fact that it involves a great deal of my life and the path I've chosen to follow. I have no complaints about my path and the places it has taken me; enough complaints to fill a circus tent about other things, maybe, but the path I've chosen has always been the right one, and I wouldn't have had it any other way. Time, unfortunately, doesn't make it easy to stay on course. The path is straight as ever, but now it is strewn with the rocks and gravel that accumulate over a lifetime. Until three years ago it would have been easy to ignore, but it's impossible now. There is a sickness rolling through my body; I'm neither strong nor healthy, and my days are spent like an old party balloon: listless, spongy, and growing softer over time. I cough, and through squinted eyes I check my watch. I realize it is time to go. I stand from my seat by the window and shuffle across the room, stopping at the desk to pick up the notebook I have read a hundred times. I do not glance through it. Instead I slip it beneath my arm and continue on my way to the place I must go. I walk on tiled floors, white in color and speckled with gray. Like my hair and the hair of most people here, though I'm the only one in the hallway this morning. They are in their rooms, alone except for television, but they, like me, are used to it. A person can get used to anything, if given enough time. I hear the muffled sounds of crying in the distance and know exactly who is making those sounds. Then the nurses see me and we smile at each other and exchange greetings. They are my friends and we talk often, but I am sure they wonder about me and the things that I go through every day. I listen as they begin to whisper among themselves as I pass. "There he goes again," I hear, "I hope it turns out well." But they say nothing directly to me about it. I'm sure they think it would hurt me to talk about it so early in the morning, and knowing myself as I do, I think they're probably right. A minute later, I reach the room. The door has been propped open for me, as it usually is. There are two others in the room, and they too smile at me as I enter. "Good morning," they say with cheery voices, and I take a moment to ask about the kids and the schools and upcoming vacations. We talk above the crying for a minute or so. They do not seem to notice; they have become numb to it, but then again, so have I. Afterward I sit in the chair that has come to be shaped like me. They are finishing up now; her clothes are on, but still she is crying. It will become quieter after they leave, I know. The excitement of the morning always upsets her, and today is no exception. Finally the shade is opened and the nurses walk out. Both of them touch me and smile as they walk by. I wonder what this means. I sit for just a second and stare at her, but she doesn't return the look. I understand, for she doesn't know who I am. I'm a stranger to her. Then, turning away, I bow my head and pray silently for the strength I know I will need. I have always been a firm believer in God and the power of prayer, though to be honest, my faith has made for a list of questions I definitely want answered after I'm gone. Ready now. On go the glasses, out of my pocket comes a magnifier. I put it on the table for a moment while I open the notebook. It takes two licks on my gnarled finger to get the well-worn cover open to the first page. Then I put the magnifier in place. There is always a moment right before I begin to read the story when my mind churns, and I wonder, Will it happen today? I don't know, for I never know beforehand, and deep down it really doesn't matter. It's the possibility that keeps me going, not the guarantee, a sort of wager on my part. And though you may call me a dreamer or fool or any other thing, I believe that anything is possible. I realize the odds, and science, are against me. But science is not the total answer; this I know, this I have learned in my lifetime. And that leaves me with the belief that miracles, no matter how inexplicable or unbelievable, are real and can occur without regard to the natural order of things. 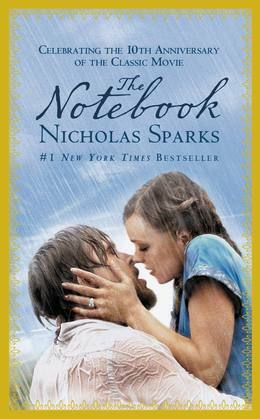 So once again, just as I do every day, I begin to read the notebook aloud, so that she can hear it, in the hope that the miracle that has come to dominate my life will once again prevail. And maybe, just maybe, it will. Every so often a love story so captures our hearts that it becomes more than a story-it becomes an experience to remember forever. The Notebook is such a book. It is a celebration of how passion can be ageless and timeless, a tale that moves us to laughter and tears and makes us believe in true love all over again . . .
At thirty-one, Noah Calhoun, back in coastal North Carolina after World War II, is haunted by images of the girl he lost more than a decade earlier. At twenty-nine, socialite Allie Nelson is about to marry a wealthy lawyer, but she cannot stop thinking about the boy who long ago stole her heart. Thus begins the story of a love so enduring and deep it can turn tragedy into triumph, and may even have the power to create a miracle . . .